Opening of the new office of the Mexican Consulate. Text extracted from the: “Los Aztecas en la casa del Sultán” by Rafael Wirth, published in LA VANGUARDIA. 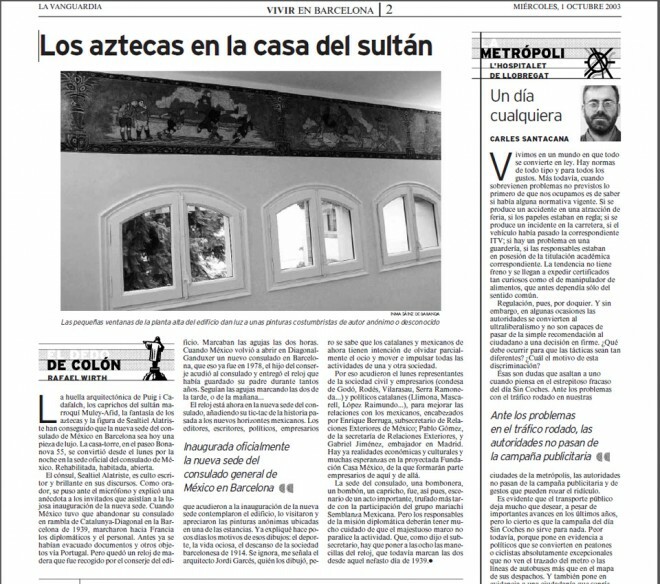 “The architectural footprint of Puig and Cadafalch, the vagaries of the Moroccan Sultan Moulay-Afid, the Aztec fantasy and the figure of Sealtiel Alatriste have made the new seat of the consulate of Mexico in Barcelona now a piece of luxury. The tower house on Paseo Bonanova 55, became on Monday evening the official seat of the consulate of Mexico. It is now rehabilitated, inhabited and open. The consul, Sealtiel Alatriste, is worship and brilliant writer in his speeches. As a speaker, stood at the microphone and told a story to the guests attending the lavish opening of the new headquarters. When Mexico had to give up its consulate in Rambla de Cataluña-Diagonal in Barcelona in 1939, marched into France diplomats and staff. Prior had already been evacuated documents and other objects via Portugal. But it was a wooden clock that was collected by the custodian. The needles marked two o’clock. The watch is now in the new seat of the consulate, adding ticking past history of New Mexicans horizons. The editors, writers, politicians, business people who attended the inauguration of the new headquarters watched the building, visited and appreciated the anonymous paintings housed in one of the rooms. Few days ago I explained the reasons for such drawings: sports, idle life, rest of Barcelona society in 1914. It is not known, noted architect Jordi Garcés, who drew them, but it is known that Catalan and Mexican they now intend to forget the entertainment part and move and push all the activities of both society. So Monday came representatives of civil society and business (Countess de Godo, Rodes, Vilarasau, Serra Ramoneda …) and Catalan politicians (Llimona Mascarell, Raymond Lopez …), to improve relations with the Mexicans, led by Enrique Berruga undersecretary of foreign Affairs in Mexico; Pablo Gomez of the Ministry for Foreign Affairs, Gabriel Jimenez, ambassador in Madrid. There are already economic and cultural realities and hopes for the planned foundation Mexico House, which will form part of entrepreneurs here and there.